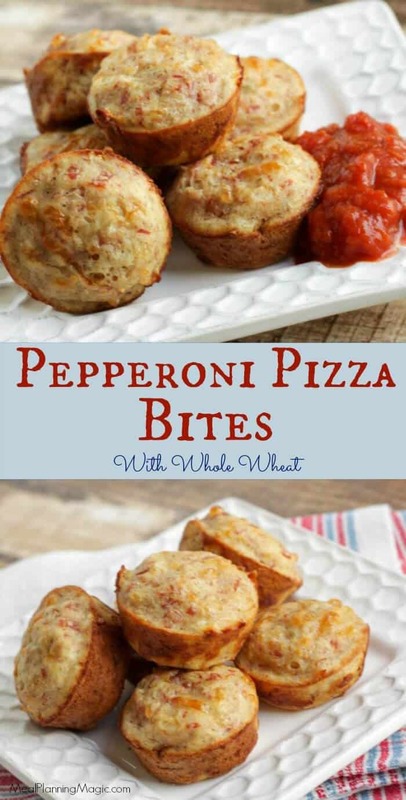 Whole wheat pepperoni pizza bites are great for any time you want a snack to share. Especially when you’re cheering on your favorite team whether that is football, basketball, baseball or whatever! They are an easy appetizer that can be served just about any time of the year. The photos here were updated on 8/18/16 but everything else remains the same. 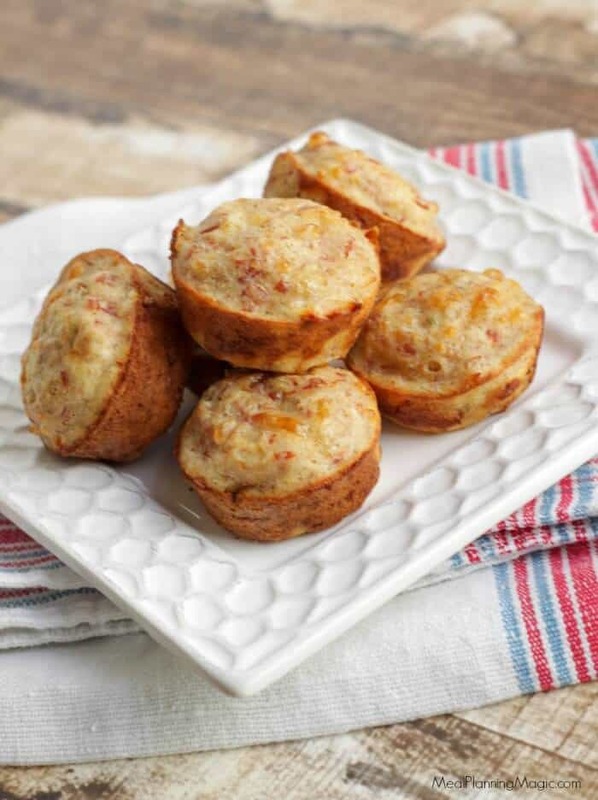 And the whole wheat Pepperoni Pizza Bites are still a family favorite! Today I’m sharing some Super Eats for Game Day! Maybe you’ll be cheering on your favorite football team today and want a snack to enjoy while you do. 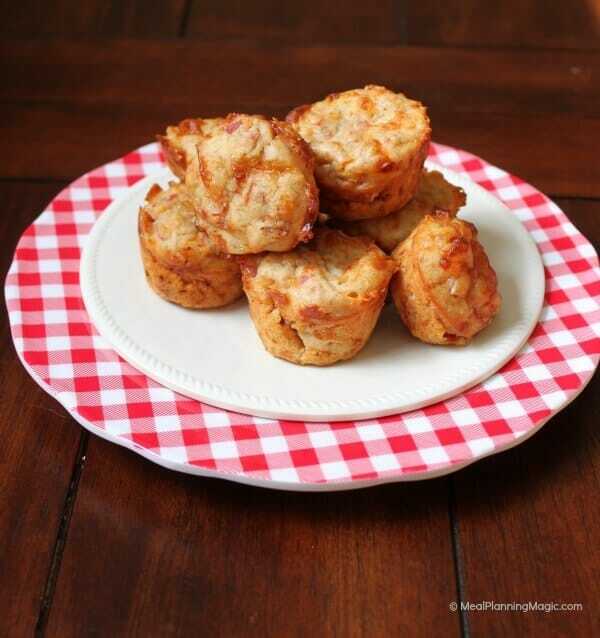 I love this recipe for Whole Wheat Pepperoni Pizza Bites because they are super simple to whip up and so yummy too! 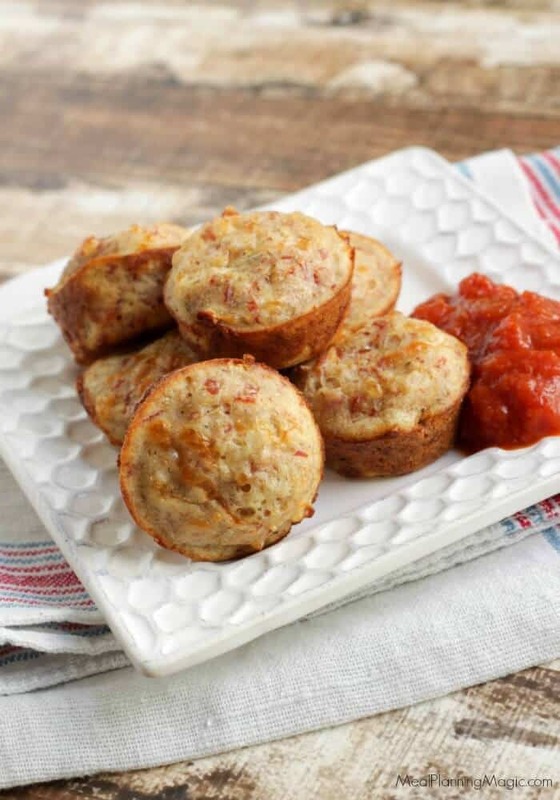 They are like a little piece of pizza wrapped up in a mini-muffin sized snack. They are made from just a few simple ingredients which makes them so much better than the store-bought pizza bites, especially with the addition of whole wheat. I actually like to make up a batch of these to keep in the freezer so I can heat them and send them with my kids in their lunches for school (I send them in a Thermos to keep them warm). The pizza sauce for dipping is optional as I think they are good just on their own, too. We sometimes like to dip them in ranch dressing too (I think that’s a Texas thing—I learned it in college to dip pizza in ranch dressing!) If you want to make up a batch of homemade ranch dressing, check out this post for Homemade Ranch Dressing. Just a few ingredients and so much better for you than the store bought stuff! Grease a 24-cup and one 12-cup mini-muffin pan. Set aside. In a large bowl, whisk together the flour, baking powder and seasoning. Set aside. In a small bowl, whisk together the milk and eggs. Add this to the flour mixture. Stir in the mozzarella and pepperoni. Re-stir the batter and divide among the mini-muffin cups. Bake until puffed and golden and they spring back when you touch them, about 22 to 25 minutes. Let them cool in pan for 2-3 minutes then remove to rack. Serve warm with the pizza sauce for dipping, if desired. Just a few simple ingredients is all it take (not shown in top pic is the milk–whoops!) Whisking egg and milk together makes it easier. I spray even my non-stick muffin pans because these can get a little stuck in the pan if not! I like to use a scoop to put the batter in the cups. Chopping the pepperoni is easier with my chopper! I sometimes need to use a knife around the edges to get them out–don’t let them sit too long in the pan and cool before removing! This week, I’m sharing my recipe with the Sunday Supper group. It’s been awhile since I’ve participated in a Sunday Supper round up. But I’m excited to see all the recipes shared this week! 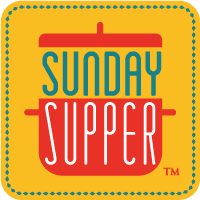 If you’re not familiar with #SundaySupper, the idea is that we all need to take the time, even if it’s just once a week, to get back to the family dinner table and share our time with family. For generations before ours, it was a weekly tradition and it’s something that we hope to make a tradition once again in households across the globe. In addition to my whole wheat pepperoni pizza bites, here are the other Game Day foods we are sharing! Vegan Puppy Chow from Killer Bunnies, Inc.
Join the #SundaySupper conversation on twitter every Sunday! We tweet throughout the day and share recipes from all over the world. « Break the Dinner Time Rut With A Basic Weekly Meal Plan!